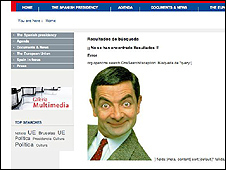 Visitors to Spain's EU presidency website have been greeted by an image of hapless fictional character Mr Bean instead of Spain's Socialist leader. An unidentified hacker briefly hijacked the site on Monday, replacing Prime Minister Jose Luis Rodriguez Zapatero with that of a bumbling comedy buffoon. 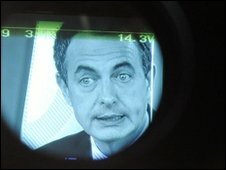 In Spain, the similarity between Mr Zapatero and the Mr Bean actor Rowan Atkinson, is a long-standing joke. The government said the site itself, www.eu2010.es, had not been attacked. In a statement, it said that a hacker had taken a screenshot of the homepage to make a photo montage. "The alleged attack exploited a vulnerability called cross-site scripting," it said. For most visitors, this meant that a smiling Mr Bean replaced Mr Zapatero, complete with a benign smile and the words "Hi there". In a recent edition of El Pais, Mr Zapatero was depicted as Mr Bean in a cartoon above an article that was highly critical of his handling of the economy in Spain, where unemployment has reached almost 20%.